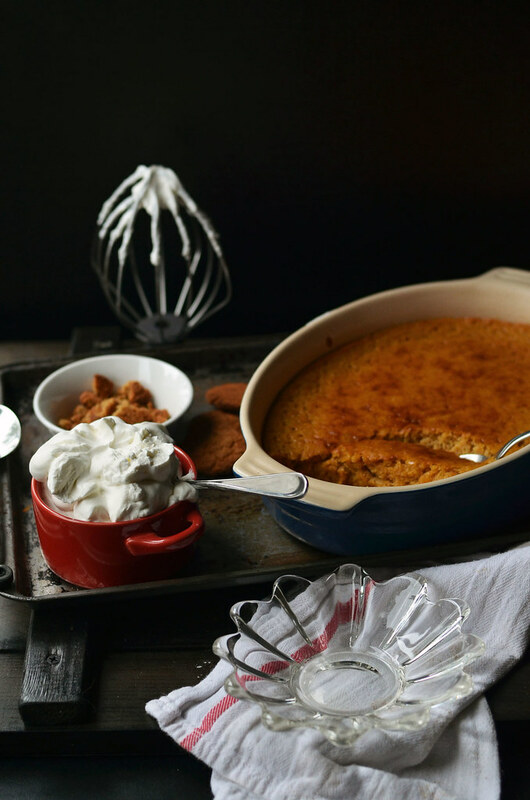 Pumpkin is the squash that is meant to be gently sweetened, blended with warm spices, and eaten with a dollop of cold whipped cream or melty vanilla ice cream. Reserve it for such and utilize the gazillion other squashes for your soups, stews, and risottos. A top 20 life rule that I adhere to with a strictness that would be more suitable for bedtimes and daily chocolate/coffee/ice cream/cookie/brownie consumption. Update: As I look around the internets at all the other #virtualpumpkinparty recipes, I think a life rule just went out the window. Wowza! I am trying to find the words to describe this pudding because it does not fit our usual pudding mold. It is not silky, smooth, and luscious. It doesn’t melt in your mouth. It does not swirl with whipped cream recreating the sky of Van Gogh’s Starry Night. At first bite, scorching hot straight from the oven, this pudding is fluffy and light. A faint hint of eggy custard sneaks through the pumpkin pie spices and I was reminded of my grandma’s custard pie that she dusted with a bit of nutmeg. As the pudding cools and is eventually chilled, its original delicate texture and eggy custard taste disappears leaving behind a most delightful and satisfying pumpkin pie/bread pudding smash up. 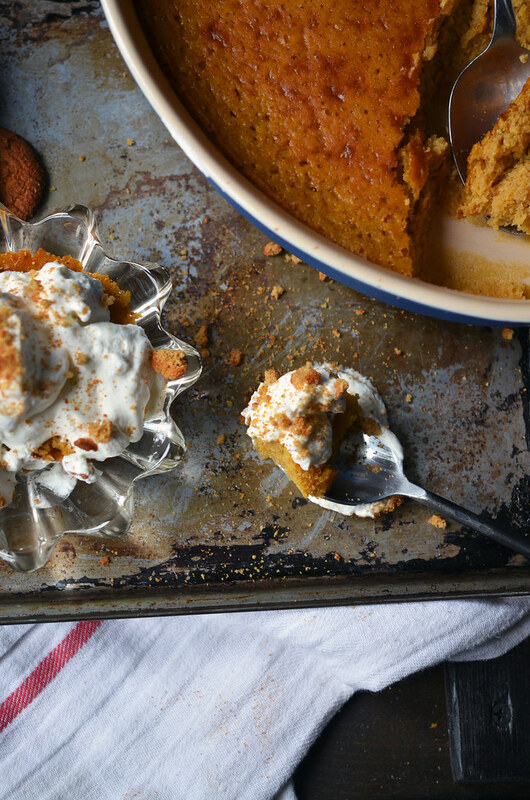 A moist homogeneous pumpkin bread pudding is what we have on our hands, here. And we don’t have to find a loaf of stale challah bread. Thank heavens. Stale bread does NOT happen in my life. I preferred eating it cold – directly from the fridge, where I eventually ended up leaving a spoon – so not to dirty all of my spoons forcing me to eat everything with a fork – with a dollop of whipped cream – also in the fridge with its own spoon. 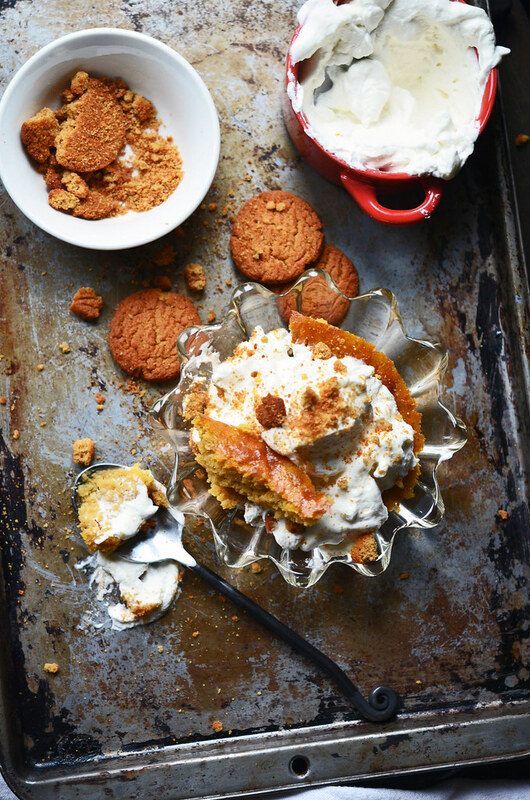 Sweeten the whipped cream with a bit of sugar or maple syrup or bourbon – because we freaking can. Crushed ginger snaps sprinkled on top never hurt anyone either. Hot, room temperature, or cold…I recommend a serving. Like bourbon on the rocks. It changes as the night moves on. Need more pumpkin ideas for the coming months? 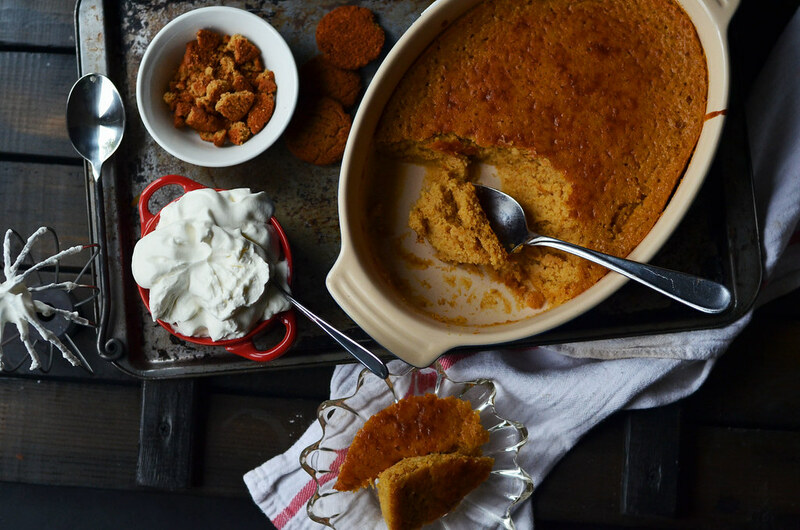 I crave pumpkin always in late winter…anyone else? You can search social media using #virtualpumpkinparty and all your pumpkin dreams shall come true. And a huge thanks to Sara for the invite to this here pumpkin shindig! Preheat oven to 400F. Butter a shallow baking dish - about 3 quart in size. Place it into a larger baking dish that has a few sheets of paper towel lining the bottom - we are going to bake this in a water bath. Set aside. (my baking dish above set perfectly into a 9x11inch glass baking dish). A roaster would work well here, too. 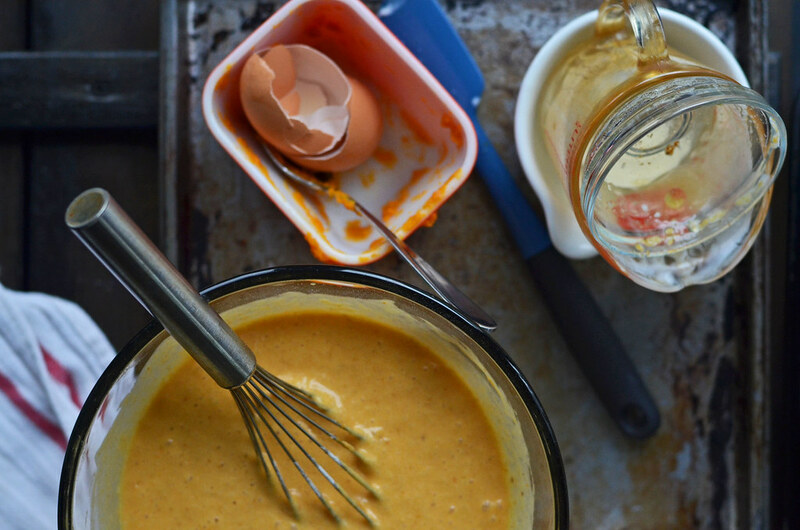 In a large bowl, whisk together eggs and pumpkin puree until well blended. Add buttermilk and melted butter. Whisk well to combine. Set aside. In a smaller bowl, whisk together sugar, flour, baking powder, baking soda, cinnamon, nutmeg, clove, and salt. 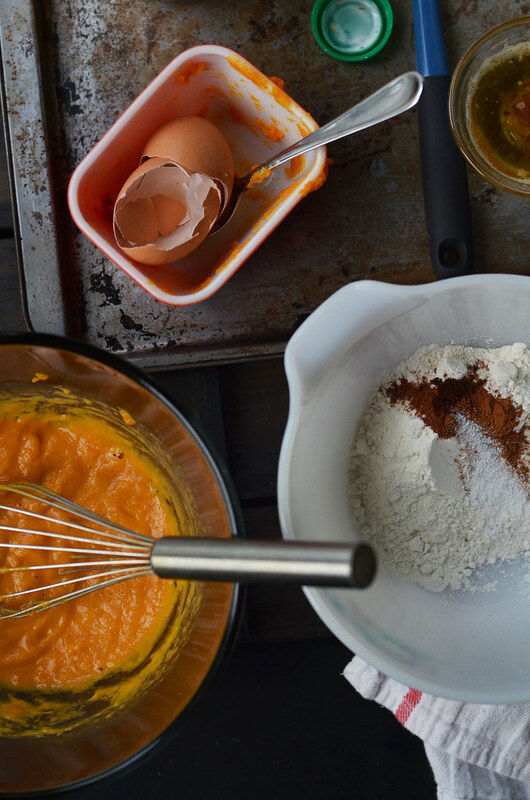 Add dry ingredients to pumpkin puree mixture and whisk until well blended. Pour into prepared buttered dish. Place dish (that is sitting inside another baking dish - remember from above) into preheated oven. Carefully pour hot tap water into larger baking dish, careful not to splash water into the pudding. Pour enough water until it reaches about ½ to ⅔rd of the way up the dish holding the pudding. Gently close door to oven and bake for about 45-50 minutes until toothpick when inserted comes out almost clean. It will be golden brown on top and puffed up. Center will be set but might slightly jiggle when nudged. Carefully remove pudding from oven, leaving water bath in oven until you want to deal with it. Let pudding cool on wire rack or eat immediately. 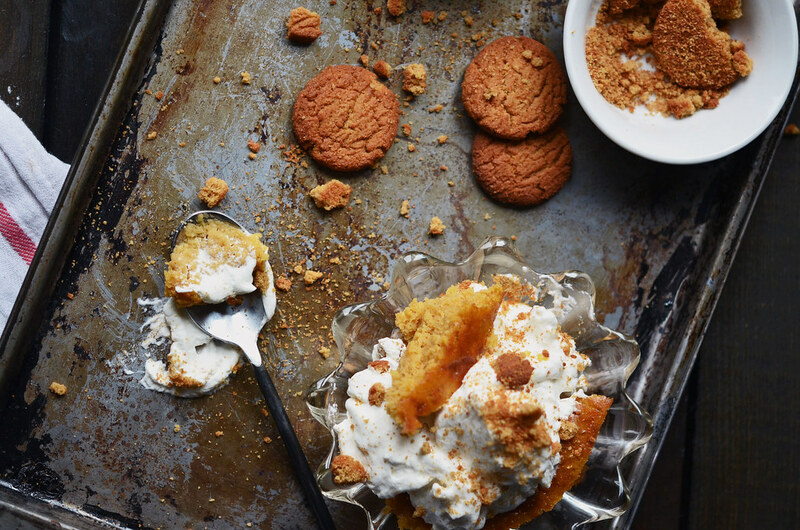 Serve with whipped cream and ginger snaps! *Is a water bath necessary? In the realm of life, probably not however without it you run the risk of having a gritty overcooked pudding and unless you are into that sort of thing, I would find a large enough pan to fit your baking dish inside. *The roll of the paper towels or a baking rack is so that no part of the dish holding the actual pudding comes in direct contact with the scorching hot oven that is cranked to 400F. Gentle heating is what we would like. *But hey, if you want to forgo the water bath...I totally get it. But don't fret - it is nothing as cumbersome and frustrating as a cheesecake water bath. Plus you are only putting water in that second large dish...so do you really have to clean it afterwards?